Audio issues again tonight; Henry was audible whilst Ceiling Cat Barbara Duncan was not. Kat was at an comic-con like event, while I was performing in the live The Tension Experience event through October, although Henry mistakenly believes it's a movie on which I was working. Henry had CC "silently" introduce the night's guests: Doug and AJ Anderson of Port City Paranormal, unaware she was completely inaudible on the podcast recording. Then it turned out that the guests were also not audible. Thinking only CC was inaubile, he has them discuss how they got into the paranormal, clearly 99% dead-air going out. Youch. The chat room, notified Henry that CC's audio wasn't coming through. Soon they did audibly come on, but while their audio was okay for the recording, at first in their respective headsets was voice-echo feedback. AJ indicated learning from Loyd Auerbach. The two investigated an east coast asylum, and a battleship they didn't name, at least while audible, or I just kept missing it when playing back the podcast. They invesigated the Belamy Mansion which they always like, always getting data on those visits. CC reported having listeners tonight in the US, Canada, the UK, Singapore, France, Belgium, and Unknown. One aspect of their investigations was perception. One a battleship, Glenn Miller music could be heard through the air ducts by multiple witnesses, but their recorders would not pick it up. In another location their video caught a brig door opening and closing on its own, while visually the door never moved. Over the course of their years of investigations, they've acquired about fifteen hundred EVPs. Doug relayed how they got a Phone Call From The Dead: AJ's late father calling and leaving a message "complaining" that the diseased tree Doug was having to cut down was a tree AJ's father had really liked. They mentioned how some paid places disrespect their paying customers, either by allowing too many so the place is overrun with investigators, another there was a handful but the owners took the opportunity to have a loud pizza party. Henry recommended they check out Bell Nursing Home, as we know how good they are over there. They gave our the group's 910-200-6563 contact number. 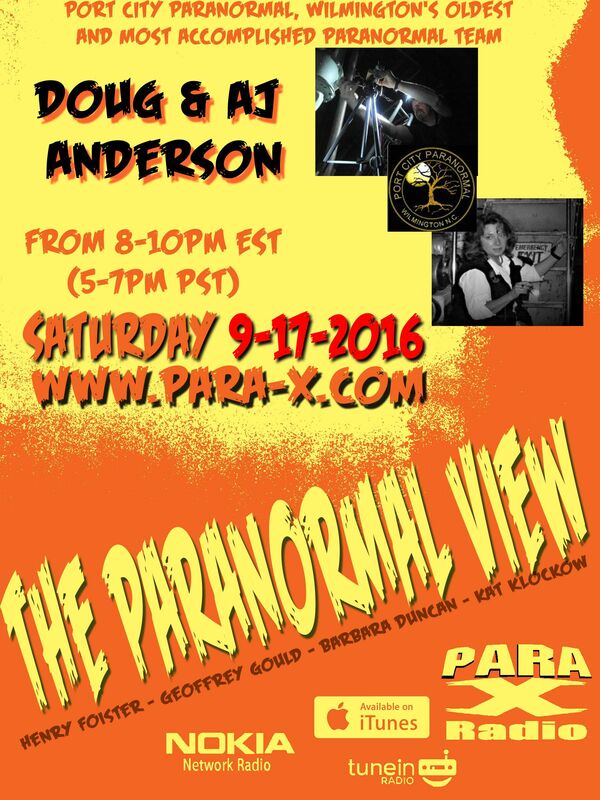 Author Doug and AJ Anderson on 17 September 2016 edition of The Paranormal View.